Surya Devara Narasaiah High School, Chebrolu from 1st form to 6th form-called school final. Head Master Mallampati Madhusudan Prasad. College Education both F.A. 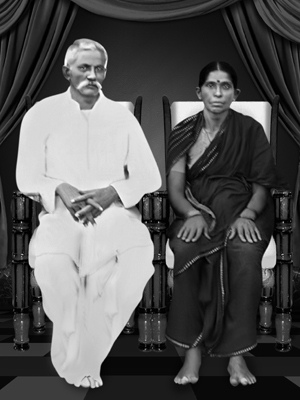 (father of arts) and Bachelor of Arts (B.A) in Andhra Christian College, Guntur from 1953 to 1958.During that period actively participated in student movements, political movements and literary movements. Secretary of Philosophy and Telugu Literary Associations in college. B.A.Honors with Philosophy in Andhra University. Stayed in Daba Gardens, Visakhapatnam with sister who was Women�s Welfare Officer. Mr.Sakhamuri Raghavarao stayed with me. My Father Rajaiah also with me. Later he died with diabetes. In Vizag actively participated in Visakha Forum along with Tummala Choudary. We always spoke in Telugu. Dr. Kotha Satchidananda Murthy was our teacher and Head of The Department of Philosophy. Joined as Personal Assistant to N.G.Ranga at his request. Toured with him and later stayed in Vijayawada (1959) Vahini weekly office and contributed Articles. From Visakhapatnam contributed articles to Radical Humanist Telugu Journal from Tenali under the editor ship of Koganti Subrahmanyam. 1960 to 64 Worked as teacher in Higher secondary school in Sangareddy, Medak District, Andhra Pradesh. Stayed with sister. My mother was with me. Trained students in scientific thinking. Student strike was organized for getting more teachers subject wise. Participated in activities in Sangareddi. Active in Teachers Union, B.R.Ambedkar writings. Translated Hamid Dalwai`s Muslim Politics into Telugu and published in Prasarita. Translated M. N. Roy�s article on Radhakrishnan from World Philosophers volume and Hema Publishers bought out as brochure. The first book on Andhra Pradesh Politics was published by Navajyothi Publishers in Vijayawada. Robert Ingersoll, Charles Braudlaugh, Tom Paine, Thomas Szasz. M.N.Roy,Carvaka, Epicurus, Spinoza, Bertrand Russell, Erich Fromm, Julian Huxley, Aldous Huxley, Darwin, Richard Dawkins, Einstein, Stephen Hawkings, Peter Singer, Grunbaum, Sidney Hook, Soltznitsin, Rene Dubois. Reading Philosophy, Sociology, Criticims of religion, exposing faith healing and alternative medicine, gathering information on child abuse by religion and exposing it.